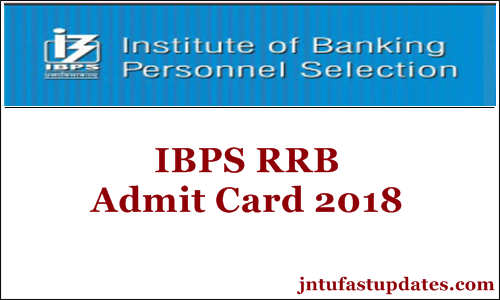 IBPS RRB Admit Card/ Call Letter Download: Institute of Banking Personnel Selection (IBPS) is going to conduct the RRB Officer Scale I, II, III, Office Assistant Examination in the month of August. Lakhs of hopefuls are going to attend the IBPS RRB Officer Scale 1, 2, 3 examinations this year. All the hopefuls are hereby instructed to download the admit cards before proceeding to the examination. Candidate’s hall ticket verification will be done at the examination centers. Hence all the candidates required to carry the admit cards mandatorily. The organization is going to conduct the IBPS RRB preliminary examination on 11th, 12th, and 18th August. Candidates can download IBPS RRB Hall ticket before the examination dates. The hall ticket will be accessible to download IBPS RRB Scale I, II, III, Office Assistant posts on IBPS Official portal, ibps.in. hopefuls competing for the preliminary test can go through more guidelines from the following article. IBPS (Institute of Banking Personnel Selection) annually conducts various banking test for various posts. The organization was established in the year of 1975 and carries out various operations in the banking sector. Railway Recruitment Board (RRB) has released the notification for 10,190 Group A and Group B Vacancies. The vacancies include officer scale 1, scale 2, scale 3, and office assistant posts. Institute of Banking Personnel Selection (IBPS) involves in personnel selection for various bank and railway recruitment posts. Railway Recruitment Board has recently released the notification for 10,190 Officer Scale I, II, III posts. Candidates aiming to get selected for the announced posts need to clear the preliminary examination, mains examination, and interview rounds. Candidates clearing the prelims examination will be sent to the mains round and candidates clearing the mains examination will be forwarded to the interview round. Finally, hopefuls clearing the interview round will get the opportunity to work in various designations. All the applicants applied for the IBPS RRB posts will have to appear for the preliminary examination in the month of August. Candidates applied for the IBPS RRB posts can download IBPS RRB prelims admit card before 10 days of the examination (tentatively). The organization will soon update the details of admit card release to all the applicants. Aspirants can download the hall ticket from the announced date. Keep checking the IBPS official portal, ibps.in on a frequent basis to download the hall ticket. Candidates will not be allowed to attend the examination without showing the admit cards. Also, the IBPS RRB Prelims admit card/hall ticket will be useful to check the details of examination venue, date and time of the examination, and other details such as candidate’s name, date of birth, signature, scanned photograph and other details. After downloading the hall ticket candidates can observe it once clearly to check all the details. Candidates can contact the IBPS authorities for any of the necessary corrections in any column. Search the RRB CWE Prelims Hall Ticket download link in organization website. Check the information in IBPS RRB preliminary Hall Ticket 2018.